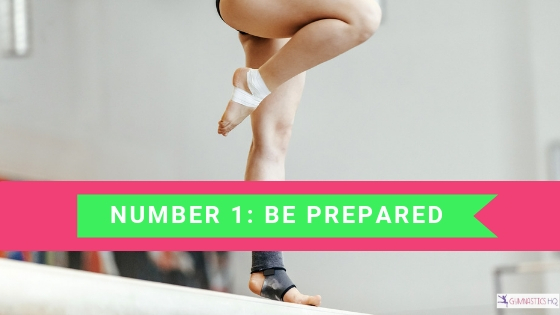 Are you a gymnast who’s getting ready to compete for the first time but you’re really nervous? Do you feel like no matter how many times you compete you do less than your best because of your nerves? Do you wonder how you’ll ever be able to settle your nerves in competition? One of the things you can do to prepare yourself before gymnastics meets is to adopt a mantra. We’ve come up with 16 mantras–maybe one of them will resonate with you! If the above statements describe you then we know how you feel! Competition requires a certain mental toughness, that’s for sure. But the good news is that this toughness isn’t something you HAVE to be born with. Rather, mental toughness is a skill you can learn and with a little practice it can become second nature so that you can keep your nerves under control. Don’t be fooled, however! Nervousness is a perfectly normal feeling before a competition and it’s your body’s way of gearing up to do its best. Even Olympian Laurie Hernandez feels the effects of nerves before a competition. According to Laurie, “At competitions even to this day before I get on the equipment, I usually feel like I’m going to have a heart attack.” With time competitions might get easier and you might feel less nervous but nerves themselves are not necessarily the culprit. It’s the way you respond to those nerves that can be debilitating if you let it be. For example, nerves can get you excited to perform your best in competition or nerves can cause you to get so scared that you shake uncontrollably when you’re up on beam. Nerves can increase your adrenaline giving you that power you need or they can give you so much energy that you overshoot your tumbling pass. Nerves can give you that extra focus you need to get the little details on beam right or nerves can shut down your mind and block you from completing a skill. At the end of the day, nerves are tricky feelings that you must learn how to handle in order to perform your best. But it’s important that you start by recognizing nerves for the powerful tool they are. And if you’re getting nervous just by reading this, don’t worry! Below we’ve detailed 6 things you can do before every gymnastics meet to help you handle your nerves and perform your best. One of the best ways to conquer competition nerves is to go into your meet feeling prepared. Ideally this starts before meet season even begins with your dedication to training hard in practice. If you’re showing up to practice with a work mindset and striving to do your best, then you’re on your way to being prepared for your meet. If, on the other hand, you’re showing up for practice but chatting with your friends every moment you can, skipping out on those last few reps, or doing your routines halfway then you’ve got work to do! If you’re serious about competing then you must be serious about practice too. Practice is truly the place where champions are made. This is not to say gymnastics can’t be fun because it should be! But save the socializing for after practice when it won’t affect your performance in the gym. It’s also possible that you might get extra nervous if you think you’re not ready to compete but your coaches do. Have faith in your coaches and trust their judgment. They know your skill ability and if they have confidence in you then you should have confidence in yourself too. Even if your skills are not quite there yet but your coaches want you to compete anyway, trust that it’s for a bigger purpose, such as getting more comfortable performing in front of judges. There’s a lot to be gained from competing at a meet that’s more than just good routines and high scores. Competition gives you a chance to get familiar with the competition environment and adjust to the feeling of being in the spotlight. The only way to feel more comfortable at a meet is to compete more often. The bottom line is that you should work hard in practice so that you’ll be prepared for your meets. And the good news is that it’s never too late to start working harder. If you haven’t been giving it your all in practice so far, then you can start today! The more prepared you feel, the better you’ll do. 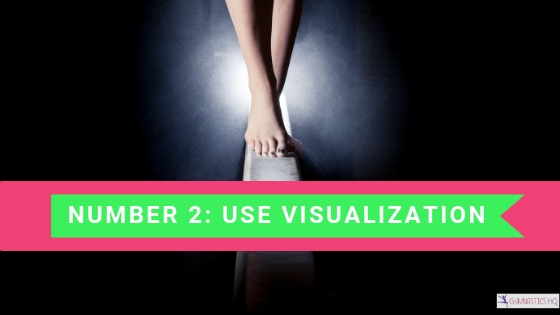 Visualization is a powerful tool that you can use to help you calm your nerves before a meet. We explained the power of having vision when we discussed making a Vision Board for your gymnastics goals, but you can also use visualization to help you prepare for your meets. Visualization simply means creating an image in your mind of how you want things to be. For example, imagining yourself doing your backhandspring with good form is considered visualization. One way to use visualization to calm your nerves is to go through a mental run-through of your routines the night before your meet. When doing your routines in your mind, imagine yourself feeling calm and at ease. See yourself sticking your dismounts and being square to the beam. Imagine yourself executing all of your skills to the best of your ability. Then, after you’ve gone through your entire routine in your mind, feel the emotions of a successful routine right then and there. For example, how would you feel if you just completed the best routine of your life? Would you feel relief, calm, excitement, or joy? Figure out what your emotions would be and play them through in your mind until you can feel them in your body. When you’re done with your mental routines you should go to sleep with confidence as though you just had the best meet of your life. When doing your mental run-throughs, make sure your routines are the same length as the time it would take you to do them in real life. You might even time yourself with a stopwatch to make sure you’re not rushing through a full routine during your mental run-throughs. You want this to feel as real as possible so your mind experiences what it’s like to complete a successful routine as though it’s really happened. If you have trouble visualizing your routines at first, stick with it. It can take time to learn how to focus your mind without distraction. The most important part is that you’re practicing these mental skills and that you feel good when you’re done. Visualization can be a powerful tool to help you ease your nerves and feel good about your skills. However, if it’s frustrating to you to try to visualize, then don’t push it. Just like anything, it takes time to develop the mental skills required in visualization. As you get better at it, however, you’ll find that you might even be able to see and feel the littlest details of your routine, making it feel as real of an experience as possible. While you don’t have all the answers to those unknown questions, if you can figure out what the worst case scenario is and then be ok with that, you’ll be able to head into your competition knowing you can handle anything that comes your way. For example, if falling off beam is the worst thing you can think of, then think about what would happen if you really did fall. Chances are, you’d get back on the beam and finish your routine. So while falling is not something you want to happen (and we certainly don’t want you to spend time visualizing this), it’s also something you can move past if it did happen. Maybe it’s not falling that you’re worried about but it’s a mental block you’re afraid of. If you’re nervous you’ll freeze and won’t perform a skill that you’ve been working on in practice, once again ask yourself “What’s the worst that could happen?” The answer is that you wouldn’t perform your skill and you would go on with your routine. While it’s not what you’d want to happen, if it does happen it’s not the end of the world. Remember, every routine at a meet is a learning experience and can help you to improve in the future. Just getting up there to compete is a great way to gain experience for future meets. So at the end of the day, think about what your worst fear would be and realize that even if it happened to you at a meet, it’s something you can conquer. Have faith in knowing you can get through anything at a competition, good or bad. Eventually, if you learn to accept that unknowns are part of competing, you’ll feel more comfortable handling whatever comes your way. 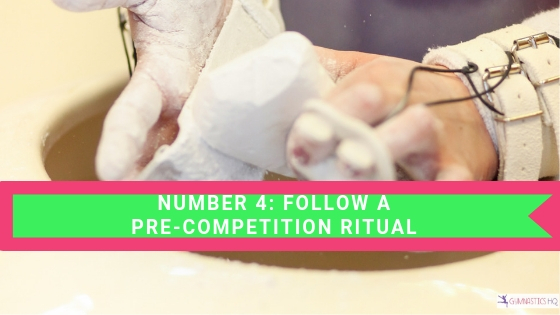 Number 4: Follow a pre-competition ritual. One of the biggest things you can do to calm your nerves before a meet is to have a pre-competition routine that you follow before every meet. Having consistency before a meet will put you at ease and help you go through the motions of competing without having to overthink things. The less your brain has to stress over what to do, the more calm you’ll feel. And if it’s something you’ve practiced over and over, chances are you’ll feel at ease when competition day comes. This is not to say that the morning before every competition has to go the same exact way because life happens. But you should try to keep certain elements of your pre-competition ritual as similar as possible so that over time you’ve been repeatedly practicing the same things. This will help you feel less nervous in the future with every meet that passes. The truth is, you might already have a pre-competition routine you follow without even realizing it. Maybe you always eat the same breakfast the morning of a meet or you wear your hair in exactly the same way. Maybe you pack your competition bag with the same snacks each meet or you listen to the same music to pump yourself up on the car ride to your competition. Most likely your coaches probably created a pre-competition warmup that you’ve practiced in the gym to prepare you for the competition warmup which can often feel rushed and different than in practice. These things can all become part of your pre-competition ritual. This is something that calms her nerves and helps her focus on her routine. It’s possible you might do something like this as well. Maybe you always squirt the same amount of pumps of water on your grips when getting chalk before your bar routine. Maybe you always take one step back before you begin to run down the vault runway before competing your vault. You might shake out your arms and legs and feel the nerves fly away before you get ready to perform your floor routine. Or perhaps you always sit in your splits while waiting to compete beam. These might not seem like rituals, but anytime you repeat the same actions before competing your routines, you are doing something familiar which helps to calm your nerves. Number 5: Adopt a mantra. Another way to ease your pre-competition nerves is to adopt a mantra. A mantra is a word or phrase that you repeat over and over to yourself. Speaking of Laurie Hernandez, we all know the story of her pumping herself up before her beam routine at the Rio Olympics with the mantra “I got this.” According to her, “-[those three words] were simply a reminder to myself that I had practiced so incredibly hard for that moment, that I could do it. I said those words to keep myself calm and focused. I said them to give myself confidence.” This was her way of giving herself a pep talk and getting herself feeling positive about her abilities right before one of the most important routines of her life. Positive self-talk is one of the most effective ways to ease fear and calm nerves but it’s important for there to be truth behind your statements. If you say something positive to yourself but don’t really believe it, then it’s time to find a new mantra. Saying something like “I’m a champion” when you’re feeling nervous and unsure of your routines is probably not very helpful. But something like “I can handle anything that comes my way” is something that might feel more believable to you and give you a confidence boost. So now it’s your turn to think of a phrase you can say to yourself before every routine. Maybe it’s something like “I can do this” or even a reminder like “straight legs, pointed toes.” Play around until you find a mantra that feels good to you. Once you do, start using this mantra during practice so that it becomes familiar to you. You might even print this mantra out and hang it up in your room where you see it daily so that it becomes second nature. When you land on the right mantra for you, you’ll know. Until then, keep trying out different phrases. Number 6: Focus on what YOU can do. When you go to meets it’s easy to focus on what place you’ll get because you’ve been training hard and you want to come out on top. No one goes into a meet thinking they want to get last place! And while there’s nothing wrong with wanting to get a medal or to win the meet, it becomes a problem when that’s your only measure of how well you did. Comparing yourself to other gymnasts can make you feel extremely nervous because after all, it’s another thing that’s unknown. Instead of focusing on things you can’t control during a meet like where you place or how good your competitors are, what if you switched your focus around to some things you CAN control, like your form? What if you made it your goal to point your toes and keep your legs straight during every routine? This way your focus is on skills you yourself control and not on the end result. Or maybe you focus on sticking all of your landings. You could even make it a goal to have fun during your routines! After all, that is THE point of doing gymnastics! At the end of the day, your biggest competition is always YOU. If you can wrap your brain around this then nothing can stop you from accomplishing your biggest dreams! So before your next meet settle on a few things you want to focus on in competition and then think about those things before the meet starts. Having some clear cut goals that are purely related to how YOU perform can help to ease your nerves once you arrive at competition because it gives you something to focus on other than your competitors or where you stand in the rankings. Getting nervous before a meet is something that happens to every gymnast. However, some gymnasts have learned how to handle their nerves better than others. Remember that conquering your nerves in a competition starts with how prepared you are for your meet, so treat practice seriously and work as hard as you. Next, visualize yourself doing your routines the night before a meet and go to sleep feeling the effects of your perfect routines. The day of the meet, it’s important to keep a consistent routine and to do some pre-competition rituals that you are familiar with. Right before your routines, use a mantra to help pump yourself up and give yourself confidence to compete. And finally, during the meet focus on how you’re doing in regards to the goals you set for yourself instead of comparing yourself to the gymnasts around you or focusing on where you place in the standings. With time you can learn how to get a handle on your nerves and compete with ease. But always remember that nerves are a sign you want to do well and that your body is getting prepare to do its best. So embrace them and remember to have fun and to try your best! After all, there is no better feeling than coming home from a meet feeling satisfied that you did your very best. Want to read more? Check out these 7 Ways to Develop Confidence as a Gymnast. For some reason your gymnastic mantras PDF are not downloading. 3. Once you get to the competition, use headphones and listen to upbeat music, or spend time chatting and being silly with your teammates. Some people think you aren’t focused because you are goofing around, but the whole point of doing gymnastics is to have fun – so have fun. Get your mind off the competition until you warm up. Until then, goof with your friends, dance, and have a blast. It will keep your mind off worrying. 4. Get focused during your warm up. You have trained hundreds of hours, you will know what to do and will do it great when you get up there. Just warm up and get your body right, your blood flowing and get your stretch on. It will all work out. Thanks for the wonderful advice! These are great tips.